Originally published July 26, 2006, at GJSentinel.com. Imagine you’ve got a kit that looks wonderful before you even start working on it. Something created by Jeff Yagher, a sculptor who is so talented and well-respected by garage-kit fans that the kit is named after him instead of the character it depicts. A kit that would look great if you just set the unpainted piece on a shelf. If you’re like me, you might get intimidated and let the thing sit in its box, gathering dust until you feel you’ve gotten “good enough” to subject it to your talents. Or maybe you’d go ahead and slap some paint on it and figure, who cares that it’ll look worse when I’m finished than it did when I started? I’m doing this for fun. If you’re Steve Riojas, paints are the tools you use to bring out the details and reveal the sculpture in a new light. Produced in limited numbers by Tower of London. Prices range from $150 to $250 plus shipping; check the X-O Facto Web site for specifics. You know what I did when I first saw “Yagher Classics Vol. 1”? I cursed Tower of London. It was getting close to Christmas and I needed to spend my money on things other than model kits, but I saw that piece and reacted to it the same way I did to the neatest toys as a kid: “I want it!” I was well entrenched in the garage-kit hobby by then and was familiar with Jeff Yagher’s name, but I had no idea that “Vol. 1” represented the beginning of one of the best series of kits ever produced. I thought, “I’ll resist. It’s a model kit, I don’t HAVE to have it.” But all I’d seen up to then was a black-and-white picture of the raw sculpture. A few weeks later I saw full-color pictures of Steve Riojas’ paint-up and I knew where a chunk of my Christmas bonus was going. Steve Riojas, 50, has lived in Denver his whole life and loves it. He’s been married for 16 years to Lori; he has a daughter, Rachel, and two stepdaughters, Crystal and Jennifer. Steve worked at a factory for 28 years; “when the company decided to shut its doors for greener pastures in Mexico, I ended up a happy art bum,” he wrote in an e-mail. Part of being this kind of “bum” is regularly contributing to Amazing Figure Modelermagazine. If the pictures and my own endorsement aren’t enough, how about a quick word from the guy who gave these “Classics” their name? 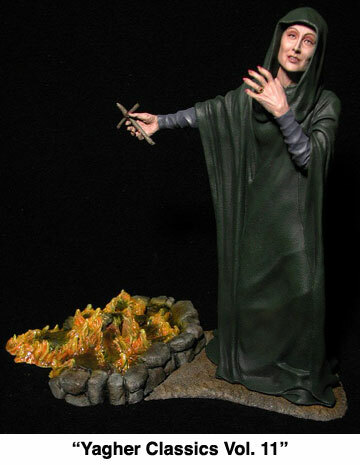 If you hadn’t seen the movie “Dracula’s Daughter,” would you know that was fire on the ground? A quick look at a picture of Steve’s paint job would show you. Plainly, Steve keeps busy. A look back through a few months of “Resin the Barbarian” entries reveals he painted the Paquet “Nosferatu” bust I wrote about June 1 and the “Batman Begins” from June 8. I’ve seen a sneak preview of his paint job on Earthbound Studios’ “Mole Man Big Head” and it’s wonderful; unfortunately, I can’t share those pictures yet, but watch for them in an upcoming issue of AFM. 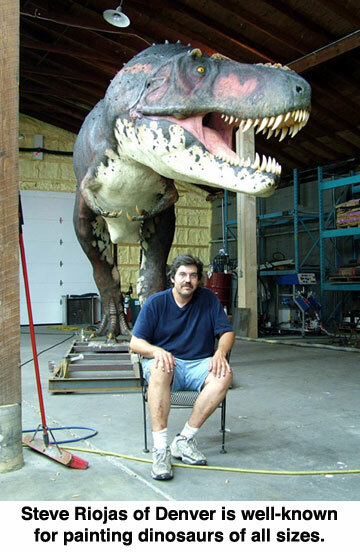 Steve has also done some amazing work on life-size dinosaurs such as the one pictured below. Resin the Barbarian: You’re one of the few people I know who seems to do a steady business of painting model kits and other subjects, as opposed to the vast majority of us who simply do it in our spare time as a hobby. Did you set out to make this happen, or is it something that evolved from your interest in kitbuilding? Steve: It just evolved. When I first got into this hobby, I quickly realized I’d never be able to afford all the cool stuff I had to have so I needed to find another way. After doing fairly well in local collectible shows and Star Trek convention contests, I found I was able to trade buildups for kits and it took off from there. If you told me then I’d end up actually making money doing this, I wouldn’t have believed it. I still do trade now and then, especially kit producers such as X-O Facto, because I love kits and feel these guys spend enough money producing a kit and don’t need to be paying out for a paint job. RtB: When and where do you do your work? How many hours in a day or week? What tools do you use most frequently? Steve: I work out of my garage, an unheated one-car that’s a lot of fun in the middle of January, but I needed the large door opening to bring in smaller 1/1 dinosaur models when I was involved with CM Studio. That plus storing supplies, boxes, etc., it made sense to stay there. I pretty much work every day, usually 10 to 12 hours, unless it’s close to show time, then it’s day and night. My main tool would be the airbrush, probably 90 percent of everything I do, but I’ll use whatever it takes for the job at hand. RtB: The “Yagher Classics” series launched more than a year and a half ago, and you’ve painted what I guess you’d call the “masters” for all of them. Do you have a favorite among the “Classics”? If so, which one and why? Steve: Man, that’s a tough one. 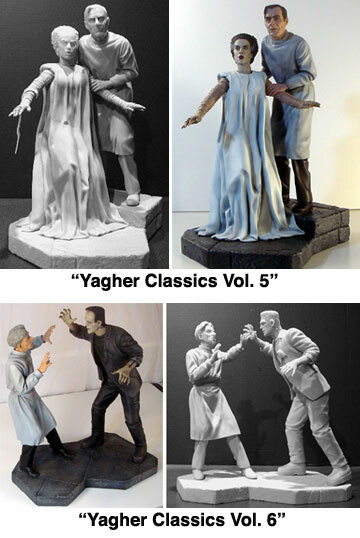 I really do like the entire line for two reasons: I love the Universal Monsters and mainly, I am and have always been a Jeff Yagher fan. To me, his work is “garage kit” in the classic sense, he’s like the godfather and to work on this line is an offer I could not refuse. Seriously, I really do feel lucky to be able to paint these beautiful sculptures. RtB: You have painted all of these kits in full color, yet they all come from black-and-white source material. The colors you end up with usually just seem to make sense, but every now and then I wonder at your choices. The Phantom in a red coat? Never occurred to me, but I like it. The lining of Dracula’s cape is periodically debated; you chose red. Who decides what colors will be used on each kit? And, are they chosen because they’re believed to be “authentic” in some way to the source material, or because they’re visually appealing? Steve: Like everyone else, I have an idea in my mind of what these characters should look like, no doubt influenced by countless images going back to when I was a kid in the ’60s ingesting anything monster, to what we have today. I usually stay pretty conservative with my color choices unless a customer would like to see something different, which I am happy to give them. 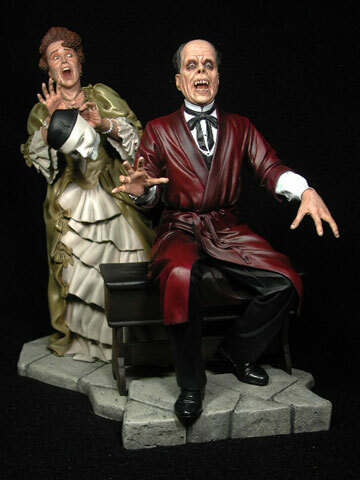 John Tucky wanted to see more color on the Phantom and suggested a burgundy coat, which I think worked very well. The same with Dracula’s cape; the red lining gives a shot of color to an otherwise black and white paint scheme, plus, I think it also has that classic look from the old days. John leaves most of the color choices to me, but think it’s a good thing to go over the paint jobs together as well as asking Jeff what he’d like to see on his sculpts. You can’t go wrong getting as many ideas as you can to make the best presentation possible, plus make a deadline. So in the end I guess it’s be authentic and pretty at the same time. 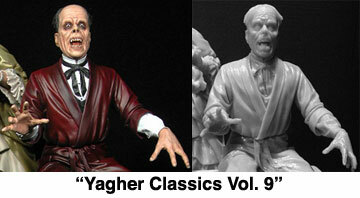 RtB: Which of the “Yagher Classics” was the easiest to build and paint, and why? Which was the most challenging, and why? Steve: I guess the easiest of the classics to do is Frankenstein. His look is textbook, dirty black clothes are a snap. I tend to go with the gray/green flesh as opposed to the healthier look you see a lot of these days but I suppose that’s a sign of my age. As far as most challenging, the Phantom was a bit more intense because I really wanted it to look good and I stressed on it more trying to get the girl’s clothing realistic. 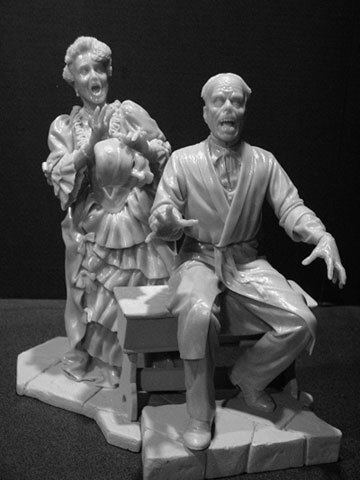 RtB: What kinds of reactions have you gotten from sculptors after they see your paint on their pieces? Steve: The reactions have been positive, at least no one has said anything otherwise! It really is a thrill when a sculptor gives a nod on a paint job. 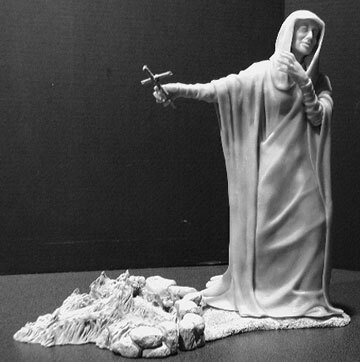 The sculpting talent in this hobby is truly amazing and it’s an honor if they like my presentation of their work. RtB: Would you like to say anything else? Steve: Well, I’d like to say thanks to everyone involved with making this hobby and the collectible business what it is. It would be impossible if not for the main ingredient, that all of us love this stuff. I’ve made some great friendships and it’s fantastic to be able to work on some of the coolest stuff ever. To be 50 and 10 years old at the same time … beautiful! This article was posted in 2006 archive, Monsters, Painters, Resin and tagged Tower of London. Bookmark the permalink. Follow comments with the RSS feed for this post. Both comments and trackbacks are closed.